T-R PHOTO BY THORN COMPTON - Marshalltown wrestlers Bennett Hageman, left, and Austin Close, right, pose in the new MHS wrestling room before practice on Monday. 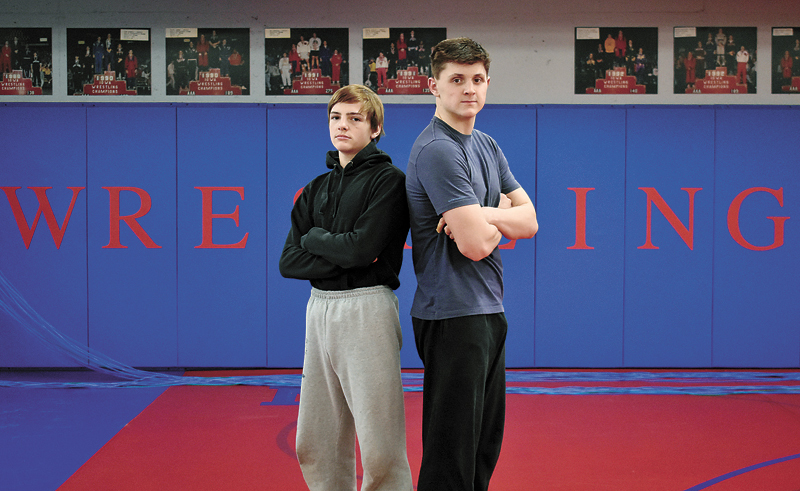 Hageman and Close will both make their debut at the Iowa High School State Wrestling Tournament at Wells Fargo Arena in Des Moines on Thursday. Two new faces will be wearing the name ‘Marshalltown’ across their chests at the Iowa High School State Wrestling Tournament at Wells Fargo Arena this season. Bobcat junior Bennett Hageman at 120 pounds and freshman Austin Close will both make their debut on the biggest stage in the state on Thursday, and MHS head wrestling coach Mike Mann said that’s an exciting prospect. 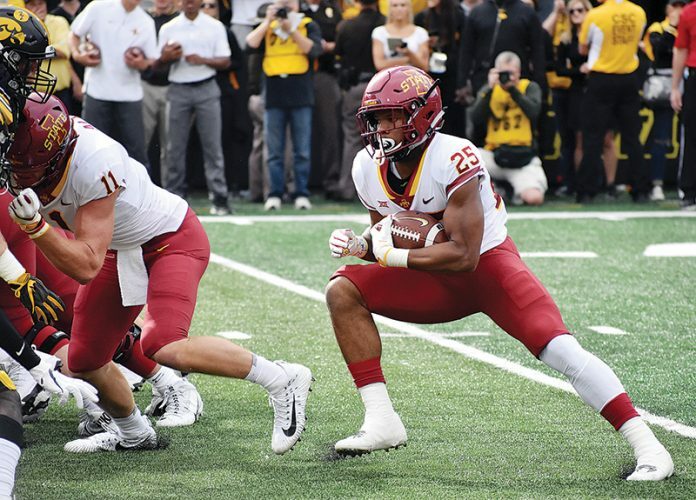 While the two boys are separated by a couple of years and 60 pounds, Mann said both Close and Hageman possess the coveted ‘it’ factor. Close (19-14) earned his first state qualification by winning his district meet with two pins, something that he said still hasn’t really set in. 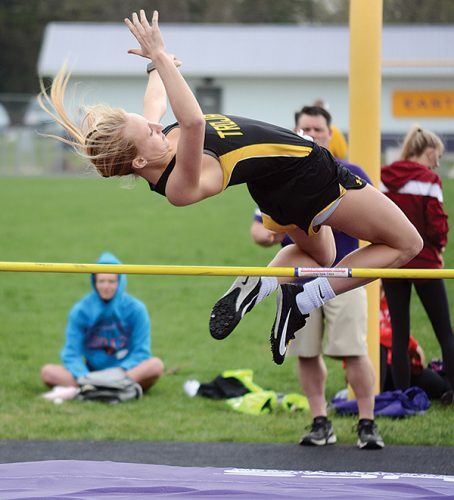 “I’m still getting over the fact that I won districts, it’s just mind-boggling,” Close said. It’s truly a rare feat for a freshman to not just make the state meet at a weight class like 182, let alone win his district. Of the 48 total qualifiers across all three classes at 182, he is one of two freshmen, along with Griffin Gammell from Waukee, who is also a Class 3A qualifier. Close is also one of two freshmen in 3A qualified in any weight class above 160, with Gammell again being the other one, and he is the only freshman to win his district at 182 this year, regardless of class. Mann said Close should be proud of what he’s done. One of the reasons Close has been presented with the opportunity before him, he said, is because of the experiences he’s gained in his first year wrestling at the high school level in the CIML Iowa Conference, one of the toughest conferences in the state. Though he is young in age, Mann said Close shows maturity beyond his years and a grasp of the fundamentals of successful wrestling. Close will have to have his fundamentals down in his first matchup of the tournament though, as he is pitted against Brett Mower from Glenwood. Mower, who is ranked No. 3 at 182 in 3A by The Predicament, owns a 43-2 record, with his only losses coming to wrestlers from outside the state. Mower was also a state qualifier at 160 a year ago, and Close said he knows what kind of a task is in front of him. What Mann said should be an advantage for Close is his ability to fight back when he’s down. Hageman (20-12) has also shown an ability to fight back throughout the season. Of his 12 losses, only two have been by extra points, and he’s only been pinned once. Mann said Hageman possesses the ability to shrug off when negative things happen, and he doesn’t get too excited for positive things. While it might not show on his stoic face, Hageman said he is excited to make his state debut. “It feels good, this was one of the goals I set for myself at the beginning of the year and it feels good to accomplish that,” he said. Last season Hageman was fourth in his district at 106, which meant he was just two wins away from a state trip, and he said that’s been in the back of his mind all season. “Throughout the year that’s been a motivation for me,” he said. While Hageman hasn’t wrestled at Wells Fargo Arena yet, he is carrying on a recent legacy from his brother, Reese, who was a two-time state qualifier at 138 as a junior in 2016 and 152 as a senior in 2017. “It was cool watching him wrestle and being able to do what he did is also cool,” Bennett said. Mann said it’s good that Hageman has his brother to lean on for advice, but it’s also a completely different feel when you step onto the mat at state yourself. “He’s been down there and he’s watched his brother, he can pull on that experience but it’s still going to be different when it’s ‘me’, and you’re actually in your singlet in the tunnel, getting ready to go,” Mann said. As for some advice he’s received from his brother, Bennett said Reese has given him a few words of encouragement. Bennett will start his tournament with a familiar foe in Nick Miller from Waukee. 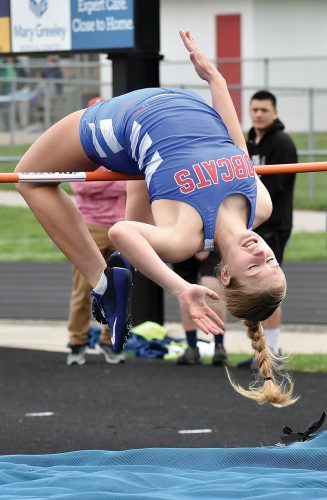 Miller (31-8) beat Bennett in their first meeting on December 13 by a 7-1 decision, and Miller finished third at 113 in the state meet a season ago. Though Bennett fell to Miller the first time around, he said a lot has changed in the past two months. Mann said it’s actually not a bad position for Bennett to be in, facing someone who he has lost to. “It probably takes more pressure off of you if the kid has beat you before, you can just relax and go instead of trying to defend something and go 2-0 on a kid,” he said. The other advantage Hageman has, Mann said, is that he is used to fighting in close matches. Both Bobcats have tough roads ahead of them in competitive brackets, but both have shown an ability to achieve more than is expected of them. Hageman said this will be valuable experience heading into his senior year, but that doesn’t mean he isn’t looking for success this season. With three years remaining in his high school career after this season, Close said for him it’s not do or die getting on the podium, his goals aren’t as lofty. Mann said both boys have what it takes to finish with a medal on Saturday, and that should be what they are aiming for. The Iowa High School State Wrestling Tournament will get underway on Thursday at Wells Fargo Arena in Des Moines, with Marshalltown and the rest of the 3A field starting at 9 a.m.